Bluebells – should we pay to view? Ashridge, the National Trust estate on the Hertfordshire and Buckinghamshire border, is one of the top places in the UK to see bluebells, according to surveys. In 2016 it decided to charge visitors to see the bluebells at some of the best locations on the 5000 acre estate. Is putting a price on our ‘national capital’ the way to conserve the countryside? A sea of bluebells in the woods in April and May is the most popular floral attraction of the year in the UK. They beat even the daffodil and the snowdrop, which can be cultivated in gardens. The bluebell is a survivor from our old countryside. Kew Botanic Gardens says almost half the global population of bluebells is found in the UK. The flower has long been one of the biggest visitor attractions in the countryside. At the beginning of the 20th century special ‘Bluebell Trains’ would convey day-trippers from London to see the spectacular displays in the woodlands of the Chiltern Hills. But it is the publicity available through the Internet and social media that has pushed visitor numbers to such high levels that the very thing people have come to see is being trampled underfoot. In 2016 the National Trust introduced charges at Dockey Wood in its Ashridge estate in the Chilterns. 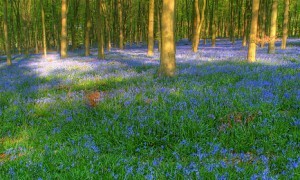 Ashridge, which sits in both Hertfordshire and Buckinghamshire, is one of Britain’s 10 top bluebell sites. Earlier the trust reported big queues at weekends and chaotic parking, which was wearing down verges and plants in the site of special scientific interest (SSSI). “The bluebells at Dockey Wood were being trampled and the ground was being compacted,” said the trust. “As a result, they were declining. In past years we’ve placed signs throughout the wood to try to reduce the damage, but this hasn’t worked. People are charged £3 (£1 for children) over peak bluebell season weekends and Bank Holidays. The charge only applies on the days listed, and the trust notes that there are many other places around the estate to view bluebells for nothing. Bluebells have an important part in our national heritage. Kew Botanic Gardens lists their key uses as “ornamental, indicator of ancient woodland, medicinal” Their nectar is food for butterflies and other insects. They are commonly found in British woodlands which have been there since at least 1600 AD, serving as indicators of ancient woodland. A glue from bluebells was used t so stick flights to arrow shafts and in book-binding. The bulb is reported to have diuretic and styptic properties, and bluebells have been used to treat gynaecological complaints. Bluebells are protected by legislation, and although not under immediate threat there are concerns about cross-breeding and the impact of climate change. This charge is a blunt, but effective, way of protecting the bluebells. It helps pay for staff tasked with making sure people park in the designated areas and keeping them to the paths, and deters some people from visiting this sensitive spot altogether. “The small charge contributes to our costs and spreads visitors more evenly throughout the week,” said the trust. Imposing a charge to view bluebells has a wider significance. It is an early example of putting a price on our “natural capital”. The report defines natural capital as the land, water and the atmosphere together with the functions or ecosystem services these provide, such as the water cycle and soil fertility. In its sixth annual report – launched in February (2019) – the UK’s Natural Capital Committee (NCC) said wildlife such as bees, butterflies, and farmland birds and bats “have either continued to decline or stagnate in number”, with only half of habitats meeting minimum quality targets set by Natural England. The government’s independent advisory body said overall progress to meeting the targets in the UK government’s 25 Year Environment Plan, launched in January 2018, “has not been good”, adding that despite some successes, only “moderate/limited” headway had been made towards some of the 10 goals it contains. The NCC consists of eight professors, and is chaired by Oxford economist Dieter Helm. The bluebells, in Ashridge and elsewhere, are an immediate and familiar example of Britain’s natural capital, even if they have no actual monetary value. They can’t be cut and sold, unlike daffodils; they have no commercial medicinal value or other practical properties apart from the ascetic. However they do have an indirect economic benefit by drawing people to a particular place, where they are likely to spend money in tea shops and pubs and other shops. Ashridge has a bustling cafe just a short drive or walk away. People are already quite used to paying to see and visit our natural capital, even if they don’t yet recognise the theory. The National Trust routinely charges visitors to its coastal and countryside estate. Ashridge is unusual in not charging for its carparks, although it is planning to do so soon. However huge tracts of the countryside, with or without bluebells, remain free and open to visitors and there is no suggestion that people would ever have to pay to experience and enjoy this wider representation of natural capital. There will be other ways of putting a price on it, through the planning system and in the UK’s national accounts. The Ashridge bluebell charge delivers a useful message, however. It reminds people that without some controls, and the ticket booth may be the best one we have come up with so far, we are in danger of loving some of our finest natural assets to death.